I’m having a very enjoyable meal at Cousin’s BBQ while in between flights at Dallas – Ft. Worth Airport. 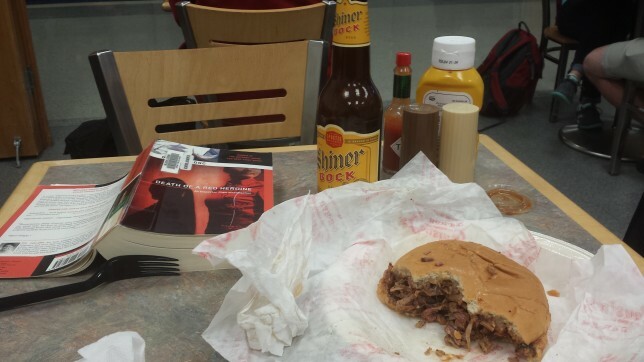 Pictured below: a chopped brisket sandwich, a cold bottle of Shiner Bock, and a fine detective novel, Death of a Red Heroine, which I’ll have finished by the time I’m back home. How did my dad get there and influence me to go there? He really, really knew that God loved him and had completely forgiven all his sins at the cross of Jesus. He did not wring his hands, wondering what God thought of him. He believed the good news, his spirit soared and he could never do too much for Jesus. Well, new to me that is. I just found out about Qiu Xiaolong, who has written a series of detective novels with Inspector Chen Cao at the protagonist. 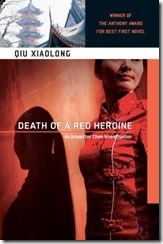 The first in the series is Death of Red Heroine, set in Communist China during the time of Deng Xiopeng’s reforms. 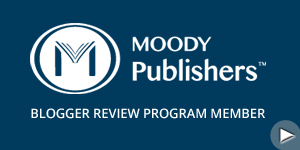 Hope to have a Brief Book Review up for this in a week or so. 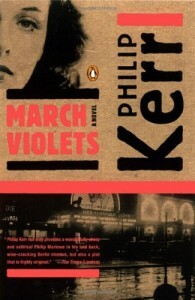 M arch Violets, set in 1936 Nazi Germany, introduces Bernie Gunter, a former police detective who, disgruntled with the Nazi bureaucracy, resigned from his position and is now employed as a private detective. Kerr does a good job of capturing the viciousness, corruption and seediness of Nazi Germany. Gunther is an interesting character, but I felt at times that Kerr overdoes the harderned, wise-cracking detective routine. The plot is interesting for the most part, but occasionally it lurched from from one plot twist to another with a slightly unconvincing ending. But Kerr has apparently had success with Bernie Gunther, and there are ten novels in the series, with an eleventh due in 2016. I might try the 2nd installment, The Pale Criminal. 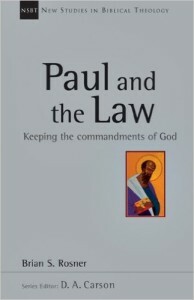 Whether or not you find this position, one held for centuries by countless Christians (church fathers, saints, and regular Christian folk like me), to be valid, I trust that we can peacefully disagree on theological points and affirm others like the Triune God (albeit there are differences here as well–Athanasian Creed, anyone? ), the virgin birth (or Immaculate Conception depending on your persuasion), and the Resurrection. Let there be unity in our diversity of views about all of the above. Apparently Hawkins doesn’t understand the difference between the Virgin Birth and the Immaculate Conception. I am not surprised that she would not understand why the god of Islam is not the God of Christianity.